Do you love Pizza? 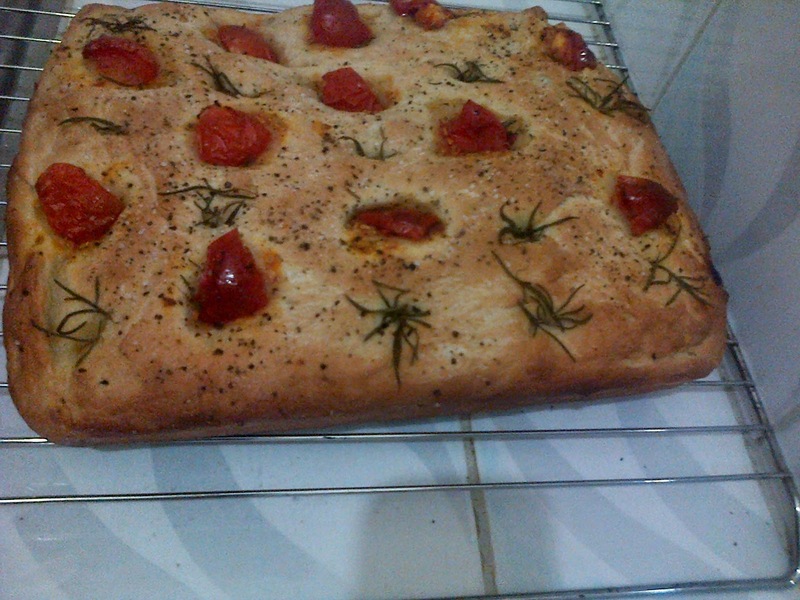 many people do.Focaccia happens to be an Italian Pizza Like Bread ,very tasty and one can employ a variety of toppings the only difference between the two types of bread perhaps being the amount of yeast employed and thick crust of the Focaccia Bread. 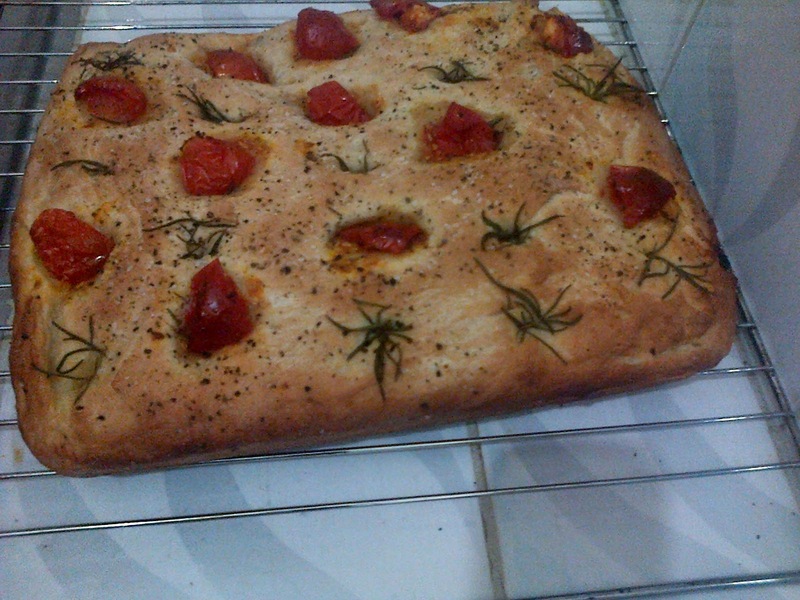 Focaccia is an easy and simple bake kind of bread and requires less skill in making than a typical pizza bread.It is very tasty and hardly takes time.I find it to be the most simple and perhaps the recommended bread type that a novice should first try their hand at. This is what i used.Makes it crunchy and flavorful. 2. 1 Level Tablespoon Salt 14gms will do. 5. 1 Satchet of Angel Instant Dry Yeast 11g(if in Kenya buy the one in a yellow box has better flavour) if not using Angel Instant Dry yeast substitute with 14 gms of any other brand Instant Dry Yeast . Three or Four sprigs of Rosemary Leaves.A can of sun dried tomatoes(due to high price and availability i do with homegrown medium size or cherry tomatoes, halve them and brush with tomato paste and voila !there you have it rich tomato flavour that will taste equally as good as some of those sun dried tomato brands on your supermarket shelf.Good cooks/Chefs think outside the box). Mix the warm water with Olive Oil. Mix the dry ingredients i.e Flour, Salt, Sugar and Yeast in your mixing bowl, make sure they are well mixed. Make a well in the flour and with your fingers widely spread resembling a fork pour the oil water mixture while incorporating the flour in middle.The dough will start coming together though sticky and tacky at first(You can use a commercial mixer with the dough attachment for around 3 to 5 minutes until the dough comes into a mass). Once the dough has come together, let rest for about 3 minutes.Dust your kneading surface lightly with flour .Dont use too much flour as your dough will absorb extra flour and become dry loosing its spring/rise quality when baked. Good bread dough must be well hydrated.Knead the dough well for around 10 minutes to develop gluten strands.Once well knead ,lightly oil your bowl place the dough,cover with thin cling film or cotton kitchen towel dusted with flour and let the dough rise in a warm area(proofing) for 30 to 60 minutes or until it doubles in size. For tips on Kneading there are a number of videos on Youtube that can make your work pretty easy in a giffy. After the dough has risen transfer to a lightly oiled and slightly salted 12 by 9 Inch square baking ting.Lightly knead and spread it to fil the the tin evenly.Using your middle index finger make finger holes on the dough in straight lines or any other preferable pattern. 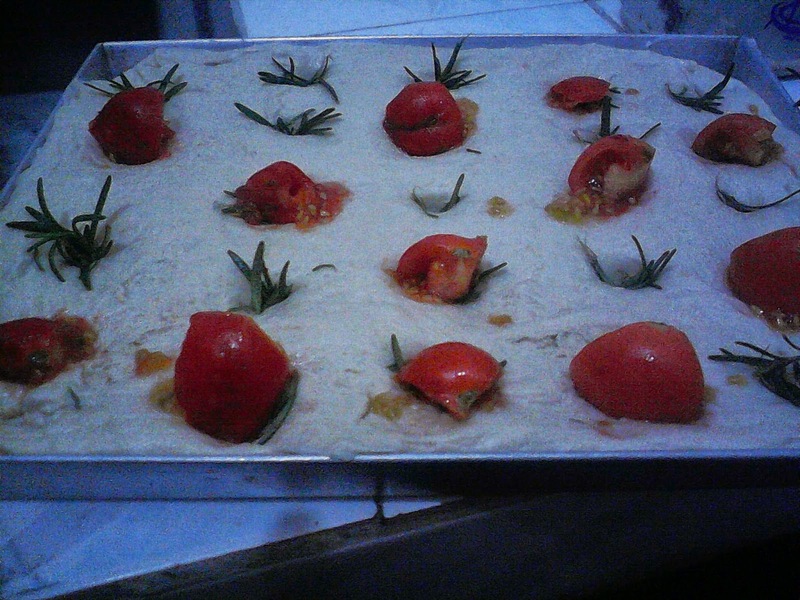 In the impressions put sprigs of Rosemary and the tomato pieces according to your preferable pattern. Finally, lightly spray or pour olive oil on the top ,you may pour some little salt and freshly ground black pepper on the surface top.Bake in already preheated oven at 200 Degrees Centigrade (gas mark 6) for around 30 minutes or until golden and cooked through. 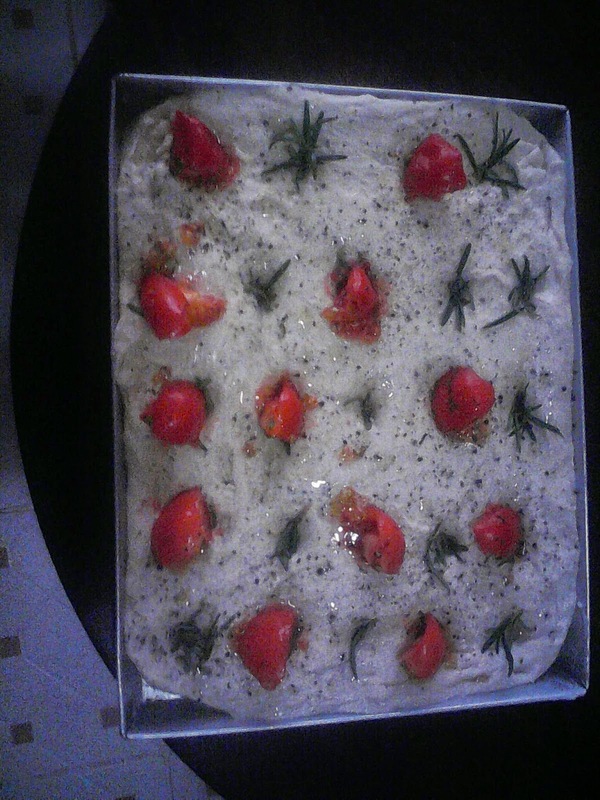 Once cooked remove from oven and baking tin and let rest on wire rack to avoid sweating. 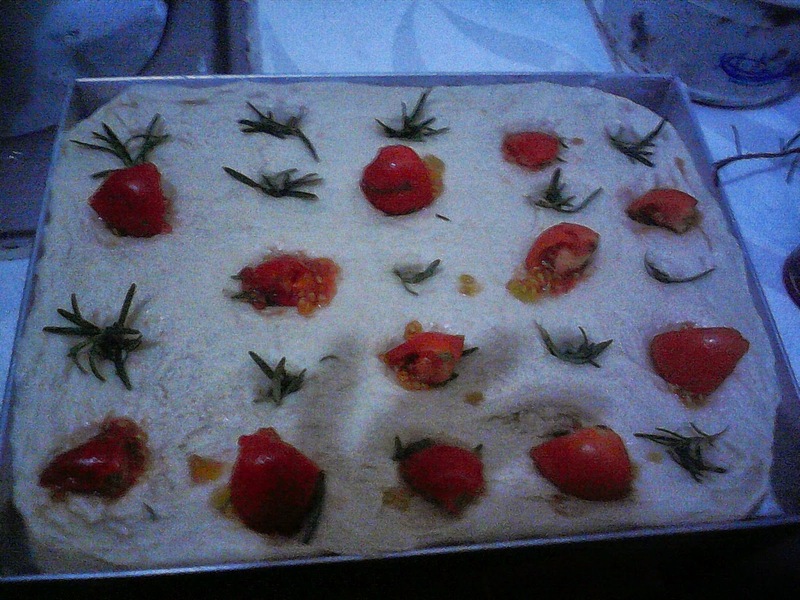 There you have it, that's how i made my easy bake Focaccia bread as you can see in the photo it looks good and taste's real yummy.My wife carried it to work and all her colleagues couldn't help but ask for the tiniest morsels ,its so good you should try it!